I started this book just before Christmas and had to read it in small chunks ever since. It’s a tough read and broke my heart on every page. I don’t normally read more than one book at a time but I needed to punctuate this book with some lighter stuff because it was dragging me down into depression. There’s a trigger warning for you right there: take caution in reading this book if you suffer from depression or suicidal thoughts. This book is the heart wrenching memoir by the mother of a high school shooter. 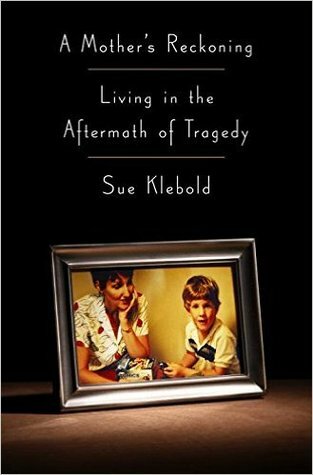 Sue Klebold was an ordinary mother, she was attentive and involved in her son’s everyday life but she didn’t pick up on the subtle signs which could have shown her what her son was planning. This book explores that very fact, highlighting how difficult it is to see into the mind of another human being if they choose to hide something, in this case- depression. Dylan’s parents had no idea that he was suicidally depressed for years before he took catastrophic action, and I for one believe that there’s no way they could have known without specialist advice. Unless you’re looking at your loved ones and specifically for signs of suicidal or homicidal thoughts, how would you spot those signs? How many of us look at children and wonder if they’re thinking about killing themselves or others? I believe her when she says that Dylan was an empathetic and compassionate teenager. It doesn’t absolve him of anything that he did, but it does shine a new light on matters – a kind and thoughtful teenager can still do these things. Posthumously, Dylan has been diagnosed with various mental conditions which can never be definitively proven but seem very likely. Klebold uses the term ‘brain health’ a lot in this book rather than ‘mental health’ and makes an excellent point: ‘mental health’ is made to sound so ethereal, as if any illness or diagnosis would be questionable. Whereas with ‘brain health’ is sounds more grounded in fact – we believe in high blood pressure and know that it could cause a heart attack, we should believe in chemical imbalances in the brain that could cause irrational behaviour too. It’s a purely psychological use of the term, but it makes a good point.